A long, long time ago, in a time known as “the 2000s,” marketers were obsessed with casting these super-wide nets in the hopes of pulling in as many leads as possible. Blogs became content farms, covering topics that were meant to attract anyone and everyone. As far as marketers were concerned, the more traffic they could send to their sites, the better. Their underlying philosophy at the time: Attract enough fish into the net, and you were bound to have a few keepers in there somewhere. Over the years, however, an alternative philosophy began to evolve, one that gets rid of the net and replaces it with a spear. Account-based marketing. Pioneered by ITSMA (the Information Technology Services Marketing Association), account-based marketing flips the traditional inbound marketing funnel on its head. Instead of ending with a target company that’s a good fit for you to sell to (after you’ve filtered out all the bad leads), with ABM, you start with target companies. You identify the biggest opportunities at the beginning and then proactively go after them. Translation: Instead of waiting for a hundred fish to swim into your net, hoping you’ll catch the one fish you actually want, with ABM you’re laser-focused on that one fish from the start, and you’re devoting all of your energy to hauling that one, beautiful fish into the boat. ABM aspires to be ‘zero-waste’ marketing. It’s a model that targets only the companies and contacts that are likely to buy your product and that sales has pre-committed to try to close. 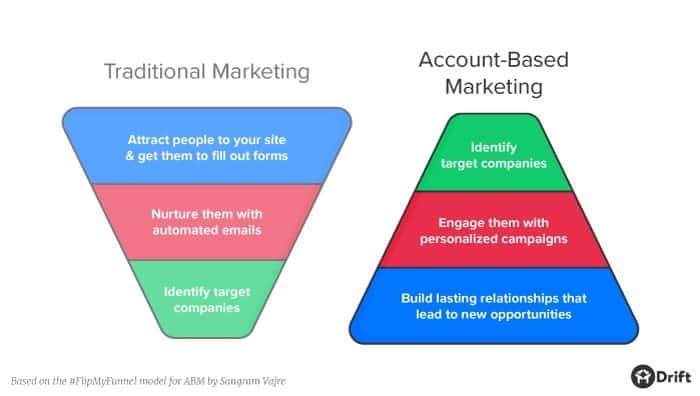 Before we continue exploring the ins and outs of ABM, let’s do a quick rundown of some common ABM terms, starting with the most obvious one: Account-Based Marketing (ABM) According to ITSMA, the simplest definition of ABM is “treating individual accounts as markets in their own right.” Remember, when it comes to closing a deal, it’s rarely a single person making the decision. (With enterprise deals in particular, 17 people are typically involved in the decision-making process…17!) ABM differs from other types of marketing in that it acknowledges all of the different people — and different viewpoints — that comprise each account. Rather than relying on blanket campaigns that are meant to appeal to an entire industry, ABM uses highly targeted, personalized campaigns in order to win over particular accounts. Coverage In ABM-speak, “coverage” refers to how much you know about a given account. For example, how many relevant contacts have you identified from that account? How much relevant information have you gathered? Coverage measures the completeness of the research you’ve done. Firmographic Think “demographic,” but for companies and firms. “Firmographic” refers to company characteristics such as number of employees, industry, annual revenue, location, etc. Account-based marketers look at firmographic data when researching accounts and developing ideal customer profiles (see below). Ideal Customer Profile (ICP) It’s sort of like a buyer persona, but instead of defining the characteristics of an ideal buyer, an ideal customer profile (ICP) defines the characteristics of an ideal customer account. Using firmographic data (see above), technographic data (see below), and sometimes predictive analytics (see below), an ICP highlights the common attributes of accounts that are likely to buy. Note: In some circles you might hear the term “account persona” being used instead. Key Account, Key Account Management Key accounts refer to customer accounts that are crucial to a company’s success. One common definition I’ve seen: Key accounts are the 20% of customers who make up 80% of a company’s overall business. (Note: Prospects who have the potential to fall into this 20/80 category can also be referred to as key accounts.) “Key account management” is a systematic approach to managing these crucial customer accounts, with the ultimate goal being to maximize mutual value. Land and Expand After closing a new customer, the customer relationship doesn’t end (or at least not if you follow the principles of ABM). The next step is to invest in the success of that new customer, and to help them see the value in buying more seats, or buying more storage, or upgrading to a premium version of your product. This model is known as “land and expand.” While traditionally sales teams have been laser-focused on generating new business, the land and expand model places a much stronger emphasis on upselling and cross-selling existing accounts. Marketing-Qualified Account (MQA) The ABM equivalent of a marketing-qualified lead (MQL). According to Engagio, a marketing-qualified account (MQA) is a “target account (or discrete buying center) that has reached a sufficient level of engagement to indicate possible sales readiness.” Predictive Analytics Predictive analytics is a way of turning your existing customer data into a model for figuring what other companies would be a good fit to buy. It’s essentially a matching game. A predictive model will look at hundreds or even thousands of customer data points and use them to identify accounts with similar characteristics. Account-based marketers sometimes use predictive analytics for developing ideal customer profiles (see above.) Technographic Refers to the technologies that companies are currently using or thinking about investing in. Account-based marketers look at technographic data when researching accounts and developing ideal customer profiles (see above). A quick disclaimer: The goal of this section isn’t to prove that ABM is superior to inbound marketing, or vice versa — the reality is that ABM and inbound are two entirely separate strategies that can be used in parallel. While ABM is a proven strategy for enterprise deals — your Fortune 500 deals — inbound is a proven strategy for small and medium-sized business (SMB) deals — your Fortune 500,000 deals. 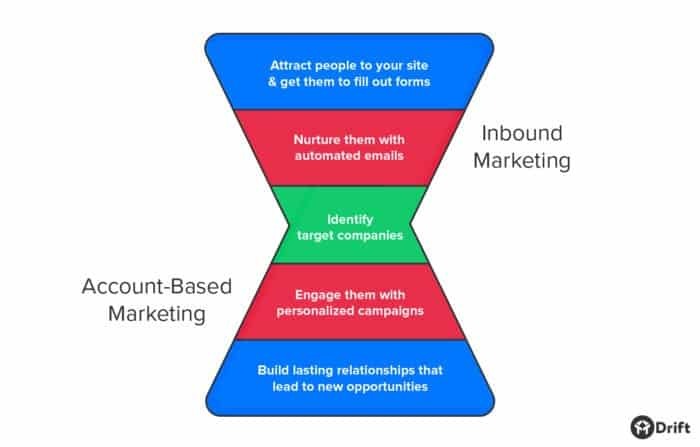 You can also think of inbound marketing as feeding into your ABM funnel. Because if an inbound lead ends up being part of a target account, ABM can pick up right where inbound leaves off. Or, to use the fish analogy again (sorry not sorry), once you’ve got a bunch of fish in your inbound net, you can use your ABM spear to pick out the ones that look promising. But just so we’re all clear on why the ABM model is different from what we’ve always been doing, here are three key points to consider. ABM is highly targeted. Instead of relying on broad-reaching campaigns that aim to draw a larger number of prospects to you, ABM focuses on just those prospects that are most likely to buy and uses personalized campaigns to engage them specifically. In order to source these high-quality prospects, account-based marketers build ideal customer profiles (ICPs) using firmographic and technographic data (and sometimes predictive analytics). 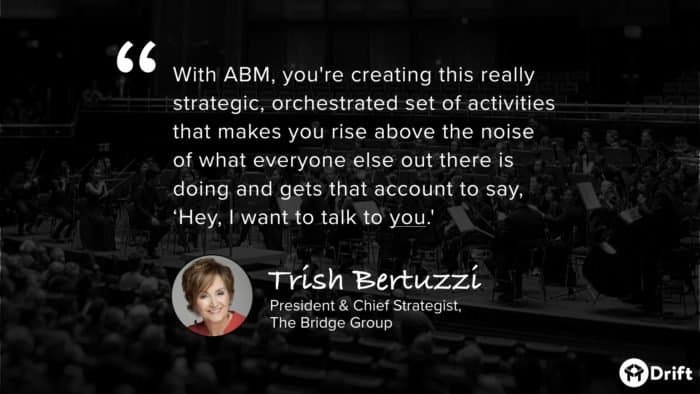 ABM focuses on accounts, not markets or industries. Account-based marketers gain a deep understanding of their target accounts in order to create content and campaigns optimized for them. This is different from your typical approach to content marketing where you’re addressing a broader market or industry. ABM targets both prospects and customers. ABM’s goal is to “land and expand” using optimized campaigns to bring in new customers and act on opportunities to grow current accounts (i.e. cross-sell, upsell). I mentioned this in the introduction, but it’s worth repeating: Because ABM is so targeted with its marketing efforts, resource-waste is limited. 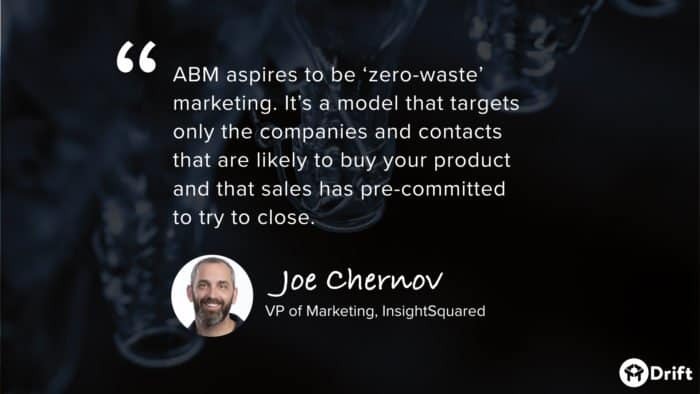 As Joe Chernov said, “ABM aspires to be ‘zero-waste’ marketing.” Remember, ABM is fishing with a spear, not a net. There’s considerably less “by-catch” as you’re only engaging with prospects that are likely to buy. Combine that narrow focus with an amazing customer experience (more on that below) and conversion rates start to climb. Instead of going broad by blasting folks with content that appeals to a particular market or industry, with ABM you go deep — you research accounts and design campaigns specifically for them. Every touchpoint along the buyer’s journey is personalized. At Drift, we’re obsessed with being customer-driven, so this aspect of ABM aligns perfectly with how we run things. Instead of doing what’s convenient for the company (re: automating everything and reusing the same content for all of your leads), with ABM the focus is on doing what’s most convenient for the contacts and decision-makers inside of your target accounts. A 2014 ITSMA survey showed that “Nearly all B2B solution providers that measure account-based marketing (ABM) ROI find that ABM delivers higher ROI than other marketing initiatives.” One of marketing’s biggest challenges has always been justifying budget. And while one ROI survey likely won’t be enough to convince decision-makers at your company that ABM is worth it, what will convince them is proving ROI within your own company by running a pilot program. To get started, you’ll need to identify your target accounts and start developing personalized campaigns. Here are a few real-world examples you can use for inspiration. Air Cover Campaign: As business development reps (aka BDRs) work on target accounts, Terminus’ marketers target the contacts and decision-makers within those accounts with relevant online ads. The targeted ads help build awareness within accounts before and/or at the same time a BDR is reaching out. Event Marketing Campaign: Because events are a big part of their broader marketing strategy, Terminus has built an event marketing campaign playbook that covers activities that happen leading up to, during, and after events. Sales and marketing work together to identify the target accounts for these campaigns — they look at past event attendees, pre-registration lists, and also target accounts that are located near where the event is taking place. After an event, follow-up kicks into gear, which includes ads targeted at attendees, emails and social posts, and calls and emails from BDRs. Pipeline Acceleration Campaign: This campaign is technically three campaigns, but all three are focused on one thing: closing deals. Sales and marketing work together to come up with targeted messages and ads that match the opportunity stage different accounts are in — early-stage opportunities, mid-stage opportunities, and late-stage opportunities. 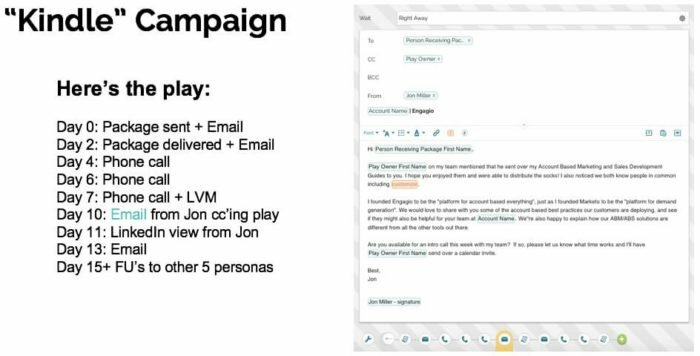 Here’s Engagio’s day-by-day breakdown of how the campaign played out: Ultimately, Engagio discovered that engagement with the campaign didn’t cluster around a particular channel. It was scattered. The takeaway: Don’t limit ABM campaigns to a single channel. Different people are going to respond to different touchpoints. The important thing is that you always deliver value, regardless of the channel you’re using. At Drift, we love the more personalized and targeted approach that ABM takes, but there’s this one inconsistency that we keep noticing: Sales and marketing teams are spending all of this time and energy becoming aligned and developing these high-value ABM campaigns (which is awesome), but then they’re serving up the same-old, form-based experience once they’ve succeeded in getting folks to pay attention. By doing this, marketers are essentially telling the contacts and decision-makers from their target accounts, “Nah, we don’t want to talk to you right now. Fill out this form and we’ll get back to you when we feel like it.” But think about it: These are your ABM prospects, the best of the best. You shouldn’t be forcing them to fill out lead capture forms, you should be rolling out the red carpet. Or, ya know, you should at least be giving these folks the opportunity to chat with you in real-time. And with today’s messaging technology, sales and marketing teams can do more than just have live conversations. Imagine getting a push notification on your phone the instant a decision-maker from one of your target accounts lands on your website. With a swipe of your thumb, you can reach out to them proactively in real-time and provide any assistance they might need. By setting up an online profile (a.k.a. digital business card) you can give prospects a convenient spot where they can always start a chat with you in real-time. Your profile is also a place where people can find open spots on your calendar and book meetings. This is the type of white-glove treatment your target accounts should be getting with ABM. Instead of hitting them with forms once they land on your website, you should be saying hello and making it as easy as possible for them to communicate with you moving forward. 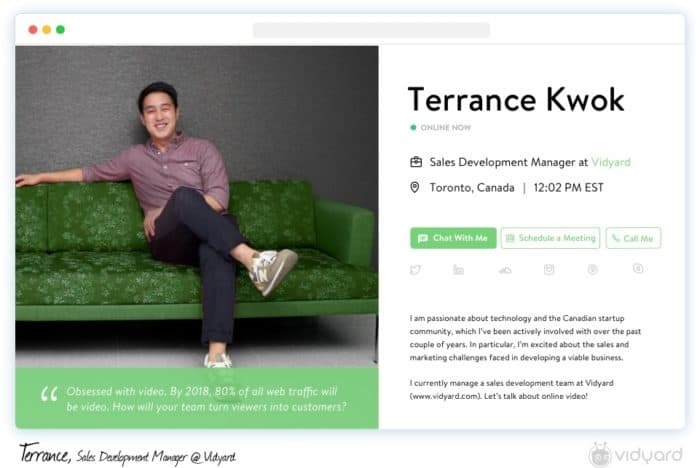 To quote the EverString blog, “One meaningful conversation with a decision-maker is more valuable than 20 leads from unqualified prospects.” So far, ABM has done a great job of identifying those decision-makers and engaging them with personalized content. This blog post originally appeared on Drift’s blog, my favorite live chat software for websites.